Aadhar Card Application: Aadhar is every Indian citizen right. The first Aadhar card was issued on 29 Sep 2010 to a resident of Nandurbar, Maharashtra. Till now there is more than 120 Crore Aadhar card issued. Aadhar is a unique identification number (UID). It helps to eliminate fake identities. The government now made Aadhar card mandatory for every Indian citizen for availing any government facilities. The Aadhar card is it among the essential documents you should have as an Indian citizen. It is so important due to the fact that the many financial institutions and mobile service providers require their customers to link their accounts with Aadhar card. Government benefits will be transferred to Aadhar linked accounts of specific beneficiaries and not otherwise. Find an Aadhar Enrolment Centre near you. You can also fill the form online. Submit the form along with supporting documents such as the identity proof and the address proof to your nearest Aadhar Enrolment Centre. After all the documents are accepted, Biometric data will be uploaded includes your fingerprints and iris scan. Your photograph is also taken for Aadhar card. Collect the 14-digit enrolment number acknowledgment slip. It is used to check Aadhar card status. The Get Your E-Aadhar necessary documents required for the Aadhar card, Such as a proof for citizenship, age proof, address proof, marriage proof (if you are married), etc. These documents can be a passport, voter ID, driving license, Birth certificate etc. Go to the Aadhar Card official website. 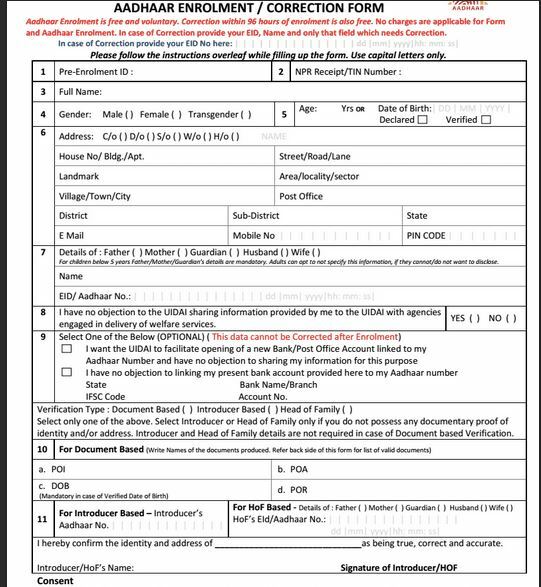 Fill the form using with enrolment number. Enter date and time as mentioned in the acknowledgment slip. Enter your name, pin code of your area and registered mobile number with Aadhar card. Fill the form using with Aadhar card number. Enter your name, pin code, and mobile number. When above steps are completed the OTP (One Time Password) will be generated, Enter the OTP & that will help you in downloading a colored version of the Aadhar letter which is as valid as the Aadhar card. The Acknowledgement slip should be kept safely till you get your Aadhar card. It can take up to 90 days (3 months), for the Aadhar card to be sent to your residential address. The card will be sent via India Post.